How to Free Download & Install Kodi for Windows 10? Kodi for Windows 10 is a free and open source media player like VLC developed by XBMC that provides feasible way for people to enjoy videos, movies, TV shows, music from the Internet and local folder on multiple platforms, say Windows 10, Mac OS, Android, iOS, etc. This guide offers you the easiest solution to free download & install Kodi for Windows 10 PC plus a Kodi Windows 10 alternative to avoid Kodi not working issue. 5KPlayer would be the best choice if you need a Kodi Windows 10 alternative or your Kodi Windows 10 just goes in error. Unlike Kodi Windows 10, 5KPlayer allows you to play offline videos movies songs as many as possible on Windows 10 PC/Mac/Apple TV and enjoy online streaming media without installing any third-party add-on. Kodi for Windows 10 Download Requirements: Kodi, like VLC media player, is a common media player that available for most operating systems from Linux to Windows 10. But, considering that Kodi needs installing various add-ons to get streaming media, you need a 3D capable graphics hardware controller for all rendering. More specifically, Kodi Windows 10 runs well on what (by Intel Atom standards) are relatively underpowered OpenGL 1.3 (with GLSL support), OpenGL ES 2.0 or Direct3D (DirectX) 9.0 capable systems that are IA-32/x86, x86-64, ARM (AArch32 and AArch64), or PowerPC G4 or later CPU based. Kodi on Windows 10 Download Method: Commonly, the most frequently-used way to download Kodi for Windows 10 is go to the official site https://kodi.tv/download/ to get one. On the official download page, you will see a center with various available operating systems where you just click the blue Windows icon to download Kodi for Windows 10. Don't worry about lookging for a specific Windows 10 version of Kodi, the Kodi websites will detect the fact that you are running Windows 10. Alternatively, you can go to Windows Store to get Kodi for Windows 10 safely. 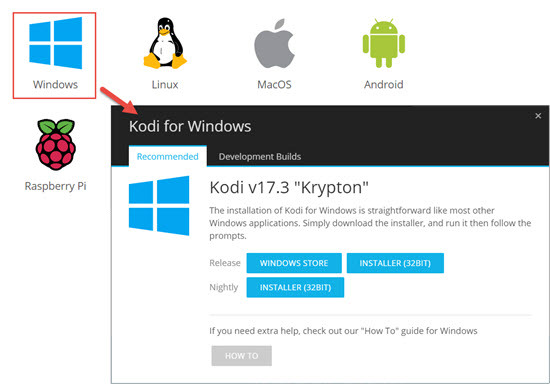 Steps to Install Kodi for Windows 10: Click the Installer button on the offcial site or Get the app icon in Windows store -> double click the Kodi Windows 10.exe -> follow the guide to install Kodi on Windows 10. Notice: During the installation process of Kodi Windows 10, you will see various add-ons that are used to enjoy online streaming media. If you mistakenly uncheck them, you need to reinstall them in case that your Kodi for Windows 10 is empty in content. Kodi for Windows 10 is totally an entertainment hub that can gather media as much as possible into a package and allows you to enjoy videos, music, movies, TV shows, etc on Windows 10 PC at will. Besides, add-ons on Kodi Windows 10 like PVR add-ons, DVR add-ons, Inputstream add-ons, etc make it possible for you to enjoy online media, record them for saving and more. More to explain, despite its Xbox-based origins, Kodi cannot be used on the current Xbox One console, but the XBMC version for Xbox is still available via the third-party developer spin-off project "XBMC4Xbox". However, Kodi for Windows 10 has also attracted negative attention due to the availability of third-party plug-ins that facilitate unauthorized access to copyrighted media content. Commonly, there are so many so-called Kodi box for media streaming and playback, which is often developed by Kodi fans and used for commercial purpose. 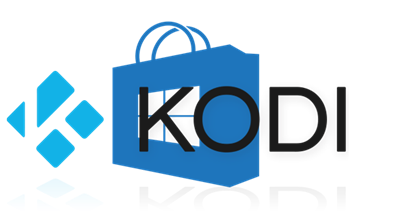 Considering that, you are highly recommended to install these add-ons via the Kodi Windows 10 application itself or download these add-ons from the offcial sites to prevent Kodi not working problem as well as get rid of copyright infringement issues. 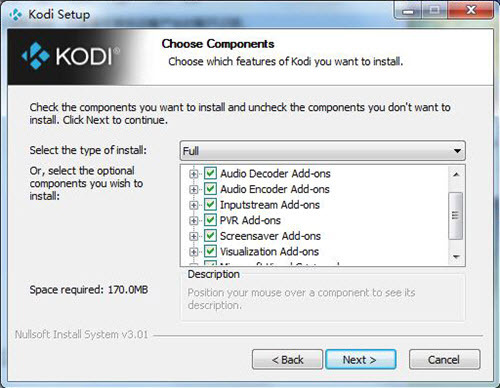 What's more, the official Kodi for Windows 10 does not contain any content, meaning that you have to prepare your own media files if you do not want to install any third-party plug-in. How to Free Download Video Music for Kodi Windows 10? Again, we suggest you 5KPlayer, the very online video music downloader that you can use to free download media files to play with Kodi on Windows 10. Speaking of add-ons on Kodi Windows 10, there are quite a few add-ons including YouTube, Souncloud, Vimeo, Crackle, Spotify, etc for you to enjoy online streaming media as long as your Windows 10 computer is internet-connected. If you need Kodi Windows 10 to play media from these sites offline, 5KPlayer will help you get access to these sites and other 300+ online sites as well. Besides, 5KPlayer is also a video music player that can play media up to 1080p and 4K like Kodi for Windows 10 without any hiccup. If your Kodi Windows 10 player stops working suddenly, you can try this Kodi Windows 10 alternative. Watching video movies on HDTV is also feasible with 5KPlayer, as 5KPlayer comes with support for Apple AirPlay Tech to stream video music from Windows 10/Mac to Apple and iOS to Windows 10/Mac wirelesly. Want to listen to the radio online? This Kodi Windows 10 alternative also works for you. Get the latest version of Total Video Player for Windows 10/8/7/XP/Vista etc to play MP4, 3GP, H264, MOV, etc on Windows 10.